In this episode of Ludo à la Maison, chef Ludo is joined by actress Minka Kelly, and together they prepare a classic French Quiche Lorraine. In this week’s episode of Ludo à la Maison, we learn how to make “ugly but good” meringue. In this episode of Ludo à la Maison, chef Ludo prepares the classic seafood soup, Bouillabaisse. In this episode of Ludo à la Maison, chef Ludo shows how to make the hearty and satisfying dish Osso Buco, served with creamy polenta. 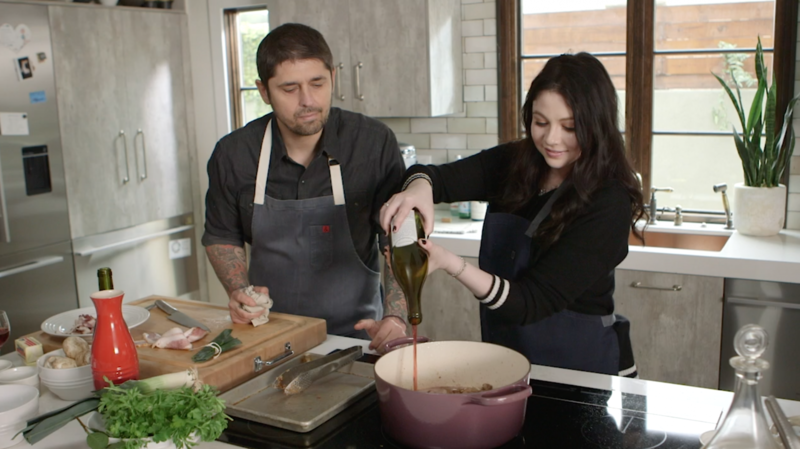 In this first episode of cooking series Ludo à la Maison's 8th season, chef Ludo is joined by his good friend and actress Michelle Trachtenberg. Together they are making the famous French dish Beef Bourguignon--a hearty beef and red wine stew. 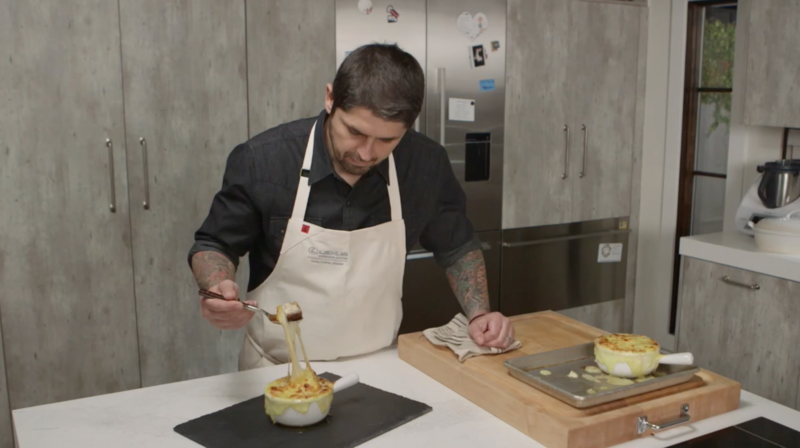 In this episode of Ludo à la Maison, Chef Ludo and his son Luca get together in the kitchen to cook the classic dish Shepherd's Pie, or Hache Parmentier, as it is called in French. Get the full recipe here. In this episode of Ludo à la Maison, Chef Ludo is joined by actress Tiffani Thiessen, sharing her family recipe for bean and ham hock stew. Get the full recipe here. Chef Ludo cooks up chicken a la créme, inspired by his newfound Belgian roots. The key the achieving perfectly caramelized onions is patience. From perfectly charred eggplant to caramelized steak, this is Lefebvre's take on a classic Korean dish. This simple dish is "spring on a plate." Lefebvre walks you through a top French delicacy. A festive meal from Chef Lefebvre. The French treat is a family favorite. A bain-marie is the key to a deliciously light chocolate cake. This Anthony Bourdain-approved recipe is inspired by Chef Ludo’s grandma. In this episode of Ludo à la Maison, the LA chef shows us his favorite fried chicken recipe. In the last episode of the season, the Ludo à la Maison star shows us his recipe for a classic flatbread. In this episode of Ludo à la Maison, the uses lamb shank for this classic Middle Eastern dish. In this episode of Ludo à la Maison, the LA chef grills up some delicious seafood for a sushi-inspired snack. The LA chef shows us how to make two classic French pancakes—one sweet, one savory. A luxurious dessert from the latest season of Ludo à la Maison. This salad is part Southeast Asian, part Los Angeles and somehow...100% Ludo. In his new cooking series, shared exclusively with Food & Wine, French chef and L.A. restaurateur Ludo Lefebvre demos one of his favorite easy recipes. For the full Moules à la Crème recipe, click here. In his new cooking series, shared exclusively with Food & Wine, French chef and L.A. restaurateur Ludo Lefebvre demos one of his favorite easy recipes. In his new cooking series, shared exclusively with Food & Wine, French chef and L.A. restaurateur Ludo Lefebvre demos one of his favorite easy recipes. To see the Sole Meunière recipe, click here. In his new cooking series, shared exclusively with Food & Wine, French chef and L.A. restaurateur Ludo Lefebvre demos one of his favorite easy recipes. For the full recipe to this flavorful Ratatouille, click here. Ludo remembers a dessert he grew up with and shows us the steps to make Île Flottante. Get the full recipe here. In his new cooking series, shared exclusively with Food & Wine, French chef and L.A. restaurateur Ludo Lefebvre demos one of his favorite easy recipes. See the full chocolate mousse recipe here. In his new cooking series, shared exclusively with Food & Wine, French chef and L.A. restaurateur Ludo Lefebvre demos one of his favorite easy recipes—steak tartare. For the full recipe of this classic French dish, click here. In his new cooking series, shared exclusively with Food & Wine, French chef and L.A. restaurateur Ludo Lefebvre demos one of his favorite easy recipes. Here, Ludo cleans a salmon filet and gives a classic cream sauce a playful twist with curry. Get the full recipe here. In his new cooking series, shared exclusively with Food & Wine, French chef and L.A. restaurateur Ludo Lefebvre demos one of his favorite easy recipes. For the full recipe to this easy French apple tart, click here. If he could eat mashed potato all the time or open a potato restaurant, he'd do it. Instead, Ludo makes a classic potato and leek soup in his house. For the full recipe, click here. In this video, Ludo tells stories and gives a multicultural L.A. twist to a traditional slow French stew. Get the full recipe here.